The level of healthcare provided by certified nurse midwives may be better than or equal to the same care provided in a hospital setting, according to research published in the journal Health Services Research. Low-income women involved with the study reported positive birthing experiences at the hands of nurse midwives, but the study also showed some physical medical benefits as well. Women who received prenatal care and birth care from a certified nurse midwife were less likely to deliver early, have a C-section or need assistance during delivery, according to researchers. 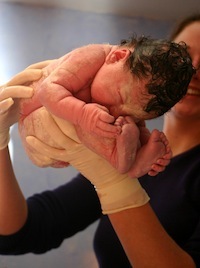 Information was collected from 872 women who received care at a birthing center in Washington, DC from 2005 to 2008. The results of the patient’s medical records were compared to more than 42,000 women receiving birth care in a traditional hospital with an OB/GYN as the primary pregnancy care provider. Advanced medical care was needed less often in the birthing center group with a nearly 10% drop in C-section rates – birthing center vs hospital care. Shockingly, nearly 30% of women receiving midwife care delivered on the weekend compared to just less than 24% of the traditional care group. In addition, a recent study showed that babies born in a free-standing birthing center had a higher chance of adverse outcomes thatn those delivered in a hospital. Additional research may be needed to support the study findings with focus on birthing center experiences across the country. This study focused solely on low-income patients receiving care at a single birthing center. Source: Sarah Benatar, A. Bowen Garrett, Embry Howell, Ashley Palmer. Midwifery Care at a Freestanding Birth Center: A Safe and Effective Alternative to Conventional Maternity Care. Health Services Research, 2013; DOI: 10.1111/1475-6773.12061.